Midnight Shadow (left) takes up the running in Cheltmeham's Relkeel Hurdle from Old Guard, centre, and Wholestone, right. DANNY COOK believes Midnight Shadow could be a National Hunt star of the future after putting up a career best performance to land the Relkeel Hurdle, the New Year’s Day highlight at Cheltenham. Even though the jockey said the six-year-old could now be a Stayers’ Hurdle contender over three miles at the Cheltenham Festival in March, he believes Cyril and Aafke Clarke’s horse could be even better in time over fences. Eventual winner Midnight Shadow ridden by Danny Cook (left) jumps the last with Old Guard ridden by Harry Cobden (centre) and Wholestone ridden by Daryl Jacob (right) in the Dornan Engineering Relkeel Hurdle at Cheltneham. The winner of last season’s Scottish Champion Hurdle at Ayr, the horse did run poorly by his own high standards in the Greatwood Hurdle at Cheltenham in November before returning to winning ways at Aintree last month. However Cook, and Bingley-based trainer Sue Smith, were determined to put a line through the Greatwood run and give the horse a second chance at jump racing’s headquarters in this prestigious Grade Two contest over two and a half miles. “He’s only a baby. He is a horse to look forward to,” said Cook who is also looking forward to a Cheltenham Gold Cup ride on Brian Ellison’s Definitly Red in March. Midnight Shadow and Danny Cook won the Scottish Champion Hurdle at Ayr in April 2018. In a select six runner field, Midnight Shadow travelled strongly for Cook against highly-rated rivals before locking horns with Old Guard and Wholestone on the turn for home and then surging clear after the final flight. And while the aforementioned Smith said the owners dream of having a runner in the two mile Champion Hurdle at Cheltenham, she believes the horse needs to be seen over longer trips to be seen at his best. Thistlecrack, pictured winning the 2016 King George VI Chase under Tom Scudamore, will head straight to the Cheltneham Gold Cup according to owner John Snook. The former Grand National-winning trainer, who has made no secret of her high regard for Midnight Shadow, added: “He is a very nice horse. He has obviously got a touch of class and jumps great and he has got a very big engine. “He is on the improve and long may it last. Hopefully he will keep sound so we can keep going as he will be a fantastic chaser next season. “We were all a bit disappointed with his run here last time. We couldn’t find a reason why as he was perfectly healthy at home and he seemed right. Maybe it was the big field or the fact the ground was a bit quicker, I honestly don’t know. “He went and won really well at Aintree and we were hopeful coming here, but not confident as we didn’t know if he handled the track. We’ve learnt today he does. “The owner is keen on the Champion Hurdle, but I don’t think we can go back in trip. It is a possibility we could go for the Stayers’ Hurdle with him, but it will all have to be discussed. The ground would have to be in sensible order, which is easier rather than too fast. In other news, North Yorkshire rider Adam Nicol, who has enjoyed so much success with the Phil Kirby-trained Lady Buttons, faces a spell on the sidelines after breaking a leg following the fall of Iconic Belle at Musselburgh. He was undergoing surgery last night. The feature chase at Catterick went to Manwell for Guiseley trainer Sam England and her husband Jonathan who was in the saddle. It followed the couple’s high profile success at Haydock last Sunday with Chef D’Oeuvre. Meanwhile owner John Snook says the injury-prone Thistlecrack will head straight to the Cheltenham Gold Cup after the Colin Tizzard-trained chaser was runner up to Clan Des Obeaux in Kempton’s King George Chase. 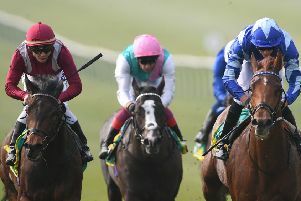 The horse has missed the last two renewals of the blue riband race. The Colin Tizzard-trained 11-year-old was ante-post favourite for the big race two seasons ago after becoming the first novice in history to win the 2016 King George VI Chase at Kempton. However, he suffered a shock defeat on his next start in the Cotswold Chase at Cheltenham and subsequently missed the rest of the 2016-17 campaign through injury. Another setback meant Thistlecrack missed the 2018 Gold Cup, but Tom Scudamore’s mount finished third in the Betfair Chase at Haydock to Bristol De Mai before filling the runner-up spot behind Clan Des Obeaux in the King George on Boxing Day. “Unless my trainer tells us any different, he will go straight to the Gold Cup. I’ve always wanted a horse to run in the Gold Cup, and this will be the third season we have tried with him, and I will probably never get another chance,” said Snook. However Thistlecrack’s stablemate Sizing Tennessee, winner of last month’s Ladbrokes Trophy at Newbury, will miss the rest of the season due to injury.